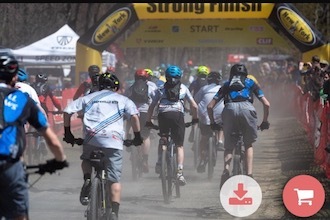 May 2, 2018: The Bronxville mountain bike team kicked off its season with an exciting race at Lippman Park in Wawarsing, NY, on Sunday, April 22. Its first race was canceled because of weather. 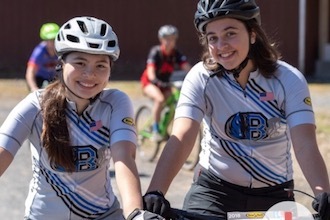 Three riders made the podium for the Broncos: Alanna Thompson came in fourth place for freshman girls in her mountain biking debut, Sofia Fenner placed second for sophomore girls, and Alana McGinness placed third for sophomore girls. The Bronxville team is currently in sixth place of 27 teams in the New York Interscholastic League (NICA). Sofia Fenner (L) and Alana McGinness (R). Photo by David Fenner. The Bronco mountain bike team began in 2013 as a club sport with just a handful of riders. Now in its third year as a varsity sport, the team has grown to include 33 riders (24 boys and 9 girls) and is led by senior captains Tyler Stupart and Jack Harwood, junior captain Sophie Geer, and head coach and high school physics teacher Benjamin Cornish. The team trains at nearby Sprain Brook Park. 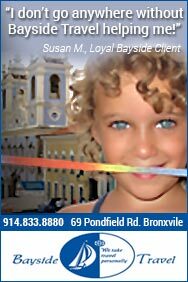 Bronxville is consistently a top finisher in the NICA NY league. This year should be no different, with both first-time riders and team veterans expected to contribute to the Broncos’ success on the trails. 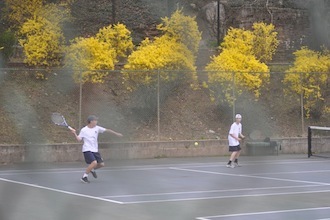 Tyler Stupart (L) and Michael Murray (R). Photo by David Fenner. Pictured at top: Mountain bike race at Lippman Park.